Nika-Tera sea terminal (Nika-Tera specialized seaport, Mykolaiv), part of Group DF belonging to Dmytro Firtash, in January-February 2019 handled more than one million tonnes of cargo, which is 56.7% more than in the same period of 2018, the press service of the company has reported. According to the company, as of February 27, 2019, Nika-Tera port had handled more than one million tonnes of cargo, significantly exceeding the dynamics of last year’s transshipment: in January-February 2018 the port’s cargo turnover amounted to 638,000 tonnes, while the figure of the first million was reached only at the end of March. “Nika-Tera port continues to master new technologies for receiving and transshipment of goods. Thus, in February 2019 the first train of railway platforms with specialized containers for bulk cargo transportation entered the port. In total, a batch consisting of 88 containers with corn was processed on 44 platforms with a total weight of more than 2,000 tonnes,” the press service of the port said. To implement the new cargo handling scheme, containers were unloaded from railway platforms to container trucks inside the port. The seaports of Ukraine in 2018 handled over 135 million tonnes of cargo, which is 2.4 million tonnes or 1.8% more than in 2017. According to live information from the Ministry of Infrastructure, posted on its website, exports in ports amounted to 98.9 million tonnes, which is 383,000 tonnes more than last year, imports to 23.78 million tonnes. In 2018, transshipment of containers in Ukrainian seaports amounted to 10.93 million tonnes (container handling grew by 11%). Domestic shipments between the seaports of Ukraine amounted to 2.1 million tonnes, which is 14% (260,000 tonnes) more than last year. 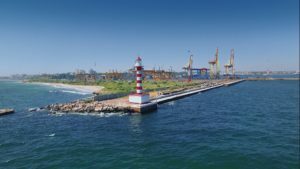 Dredging works are continuing at nine sites in the seaports, two projects in the ports of Olvia and Kherson have been prepared for concession. The number of ship journeys along the Dnipro River was 16,390, which is 11% more compared to last year. In general, in 2018 about 10 million tonnes of cargo were transported by river. Ukrainian seaports in January-November 2018 handled 121.5 million tonnes of cargo, which is 0.61% more than a year ago. 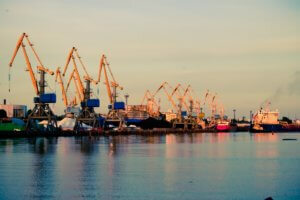 “It was possible to improve the performance of the previous year due to the increase in cargo volumes of the metallurgical and agrarian industry, as well as containers,” the Ukrainian Sea Ports Authority said on its website. According to the report, during this period, the seaports accepted and sent 10,600 ships, which are 3,080 ships (2.9%) less than in 2017. The authority recorded an increase in the volume of metal products – by 11%, to 1.45 million tonnes, as well as agricultural goods, in particular grain (by 0.1%, to 35.9 million tonnes), peas and corn (by 8.4%, up to 717,000 tonnes). In general, over the period, the transshipment of export cargoes in Ukrainian seaports amounted to 88.8 million tonnes, which is 1.4% less compared to the same period in 2017. At the same time, there was an increase in exports of ferrous metals, to 13.6 million tonnes (an increase of 9%); including 8 million tonnes of rolled metal products (a decrease of 0.9%) and 2.7 million tonnes of pig iron (an increase of 36.55%). Handling of imported cargo increased 18.13%, to 21.5 million tonnes. Imports of coke significantly increased (4.7 times, to 408,900 tonnes), chemical and mineral fertilizers (2.7 times to 313,200 tonnes). Almost one third of all imports entering Ukraine through sea ports is ore, which increased by 17.7% compared with January-November 2017, to 6.9 million tonnes. Cargo turnover of transit cargo amounted to 9.2 million tonnes, 15.2% less than a year earlier. In addition, from January to November 2018, more than 500,000 passengers were transported. In January-November 2018, 15,600 passages of ships were carried out along the Dnipro River, which were 1,324 or 8.5% more than a year earlier. 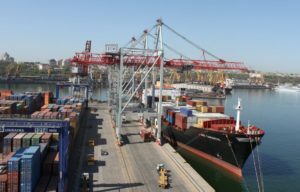 Chornomorsk seaport (Odesa region) in January-July 2018 increased cargo handling by 31.2% compared to January-July 2017, to 11.953 million tonnes. 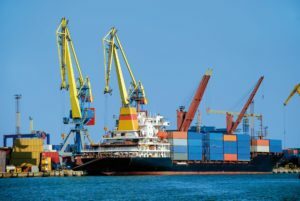 According to the Ukrainian Sea Ports Authority, for the seven months of 2018 the enterprise increased transshipment of exported cargo by 15.87%, to 8.87 million tonnes, imported goods by 2.43 times, to 2.438 million tonnes. Transshipment of transit cargo increased by 37.7%, to 618,330 tonnes, while the port handled 22,460 tonnes of cabotage cargo. Transshipment of liquid cargo decreased by 7.93%, to 933,660 tonnes, dry bulk cargo increased by 20.69%, to 7.99 million tonnes, that of non-bulk goods doubled, to 3.03 million tonnes. Transshipment of containers amounted to 98,616 TEU. Chornomorsk port is a universal international port, one of the largest on the Black Sea. The enterprise has specialized terminals and complexes, which allow overloading a wide range of goods: liquid, bulk, general. Its 29 berths are capable of receiving ships with a carrying capacity of up to 100,000 tonnes. The annual designed capacity of the port is more than 30 million tonnes. 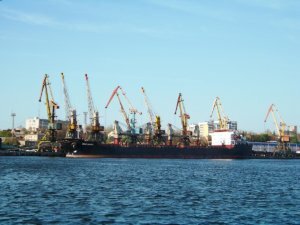 The Chornomorsk maritime merchandise port (Odesa region) in January-May 2018 increased cargo handling by 32.51% year-over-year, to 8.735 million tonnes. Chornomorsk port is a universal international port, one of the largest on the Black Sea. The enterprise has specialized terminals and systems, which allow overloading a wide range of goods: liquid, bulk, general. Its 29 berths are capable of receiving ships with a carrying capacity of up to 100,000 tonnes. 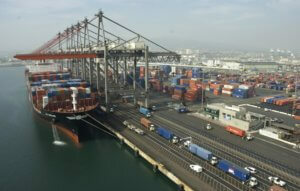 The annual designed capacity of the port is more than 30 million tonnes. The port’s capacity of container handling is 1.15 million TEU. Since 2007 the port has been capable of providing the simultaneous accepting of three ocean-going container ships with a capacity of more than 5,000 TEU and a length of up to 300 meters.